This poplar wood bar molding, also known as Chicago bar rail, gives your guests a spot for arm support. It also adds the great look of a finished perimeter around your bar. This bar arm rest is made of poplar wood lumber. Poplar wood is renowned for it’s ability to take paint well, and for being an easy wood to complete projects with. It is softer than the other hardwoods we offer, which makes it slightly more susceptible to dings and scratches than hard maple, cherry wood, or red oak wood. You can actually increase the poplar arm rest’s resistance to dents and scratches by applying a quality oil-based paint. This armrest will add comfort and style to your bar without breaking the bank. Note: All bar rails come unstained, ready to paint, stain or seal. 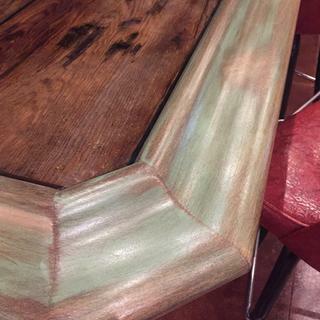 For best results, we recommend painting rather than staining poplar bar arm rests. No knicks or scratches. Slight warpage that easily layer down when clamped. Used poplar since I was painting it. Perfect for my project. Can you get an end cap for this bar rail? BEST ANSWER: Just cut a 45 and put a return piece. I don't know if you can buy an end cap. I.took a piece of 1/4 inch plywood and glued to the end. I painted the whole rail with 3 or 4 coats of black enamel and then about 4 layers of polyurethane. I am very happy with how it turned out. Hi Julie, unfortunately, we don't offer end caps in poplar wood at this time. Good question. I'm not sure. We made our own.